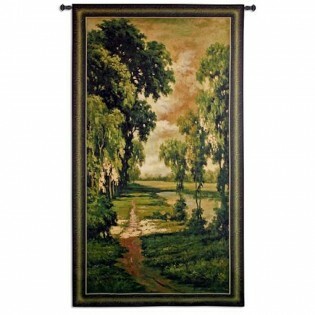 A large scale vertical tapestry of a lush forest and lake pathway meandering through the woods and beckoning you to talk a stroll outside. Predominate colors are greens, beige, tan and brown. Made in the USA. A large scale vertical tapestry of a lush forest and lake pathway meandering through the woods and beckoning you to talk a stroll outside. Predominate colors are greens, beige, tan and brown.